The latest Farrelly Brothers comedy movie, The Ringer, opened here in Australia last night. 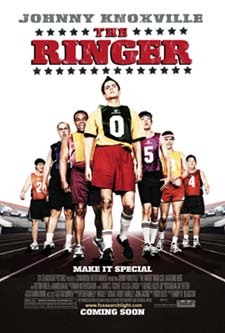 The basic plot outline is that the main character’s only option to erase a really bad debt is to rig the Special Olympics by posing as a contestant. Straight away you can imagine all the major movie-makers running away from that script! We won’t be able to get out to see the movie for a while yet, but as soon as our babysitters are back from their holiday we definitely will! Check out this great video clip, telling a vignette about a young man with Down syndrome just trying to fit in: Garth Brooks – Standing Outside The Fire. OK, it’s not a new video, but I hadn’t seen it before and it’s kinda cool.